I have to admit, I wasn’t sure what to expect from Invisible, Inc. I heard it was turn-based and that players led a squad of futuristic spies around for some stealthy shenanigans, but that was about it. The biggest aspect that had managed to slip right past me? How much of a roguelike it is. This is a key piece of info for anyone thinking of dipping in—the game lives and dies by how much someone can tolerate randomly-generated elements. As things begin, a group operating outside the grasp of dominant megacorporations has drawn too much attention, and they’re raided by shock troops. Caught unawares, they escape with their lives and a super-powerful AI that supports their efforts. They have 72 hours before the AI runs out of power and the bad guys catch them, so the fleeing agents have to get cracking. After being impressed with the slick tone and highly-stylized character designs, the thing that struck me about Invisible, Inc. is that the learning curve is… significant. Although there’s a basic tutorial (and I mean basic) there are tons of nuances that aren’t found anywhere except on FAQs or through sheer trial and error. Things like where to get ammo, how much noise running makes, what qualifies as a ‘stim’ and accepting that electronic data has weight are hard lessons to learn in the middle of a tight spot. Expect to make a lot of mistakes in the early days. After struggling with the starter agents and trying to absorb the game’s idiosyncrasies for a while, my first few missions ended in glorious disasters. However, even with all my stumbling, I’d managed to earn enough experience to unlock new agents who had different abilities. Once I got a handle on things and then realized that failure would be (slowly) rewarded, Invisible really grew on me. All missions basically involve getting in, grabbing someone or something, and then getting out again. There’s not much variety and it may sound too simple, but being warped into a hostile area with almost no offensive capability forces the gamer to play cautiously and to be hyper-aware of their surroundings. Dodging guards, peeking around corners, and locating targets before alarms start sounding is riveting. So the core concept of turn-based espionage works well in Invisible, Inc., but let’s get back to that roguelike thing for a second —every level in the game is randomly generated, and so are factors like enemy placements, available equipment, and environmental obstacles. As is generally the case with random generation, sometimes levels make sense, and sometimes (often) they feel jumbled together with no rhyme or reason. 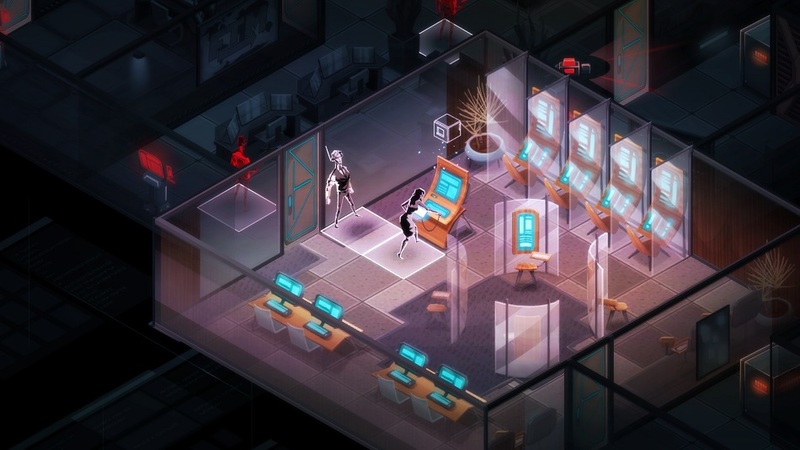 Invisible, Inc., requires players to manage the AI’s energy and the enemy alert level increases after each move. Both things add tension to this turn-based affair, but trying to deal with nonsensical floor plans often leads to wasted time and energy, and such wastes lead to failure. I also have issues with the presentation. The first thing is that the font size is tiny, and while it’s not as microscopic as some other games, it’s still too small to be comfortable. Parsing macro elements on-screen can be difficult as well. Because Invisible, Inc., is shown from a three-quarters perspective, getting a clear read in areas that overlap with each other in bizarre ways (that darn random generation again!) isn’t easy since the camera only snaps to four directions. A special mode that strips all graphics out except the floor plan helps, but it feels like an inelegant way to compensate for visuals that need improved readability. In a game where success hinges on being absolutely precise, misjudging things by a small margin can be catastrophic. Difficulty-wise, well, Invisible, Inc. is pretty damned hard. I’m no stranger to tough stuff, but character upgrades, AI upgrades, and new equipment all require money, and money in the game is tight. Worse, sometimes the gear that’s needed just isn’t available. I struggled to kit my characters to an effective level, and rarely managed to feel satisfied. Choosing different agents as they become unlocked can help, but several restarts and some luck will be needed before someone can hope for significant progress. Considering how challenging the game is and how many do-overs will occur before credits roll, it was a smart move for the devs to include a small number of “rewinds” to undo mid-mission errors. Forget to peek before that door got opened? Undo it. Drop the unconscious guard’s body in the wrong spot? Undo it. If the rewinds don’t get the job done, a player can restart a single botched level instead of the entire campaign if things go south. Some of these options are only available on the easiest difficulty, but if not for their inclusion, the fail/retry rate probably would have driven me to quit long before the end. Disclosures: This game is developed and published by Klei Entertainment. Review code was obtained from Klei and reviewed on the PS4. Approximately 8 hours of play were devoted to the single-player mode, and the game was completed. There are no multiplayer modes. Parents: According to the ESRB, this game is rated T and contains: violence, blood, language and use of tobacco. Despite the warnings, I found the game pretty harmless. Most of the violence is shown in such a small size and so abstract that it was never an issue. Agents hit guards with tasers or shoot them and they slump over—it’s not graphic at all. I don’t recall any uses of language or tobacco. There is no sexual content. Deaf & Hard of Hearing: Although most dialogue is subtitled, there were certain bits of speech that had no subtitles whatsoever. Although usually just for flavor, the absence of text was noted. In terms of sound cues, most things are represented visually, but sometimes guards make noises that are easily overlooked if the audio cue can’t be heard. Remappable Controls: The buttons are fully remappable but the sticks are locked into handling character movement and camera control.